I'm always shocked to find out how many people know of and adore noodle kugel. 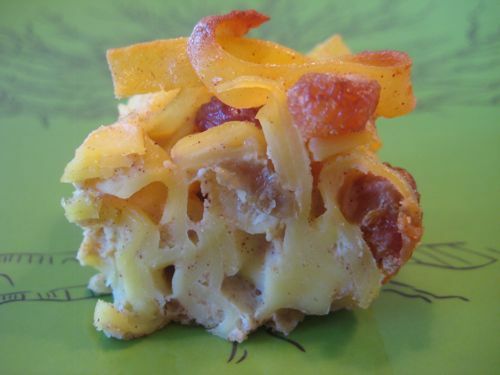 I only tried it for the first time recently, but when I shared my feelings about how much I loved it with friends, I got some pretty darn passionate responses about what a recipe for noodle kugel MUST include. The variations made my head spin. Some people said nuts were a must. Others cited raisins, cinnamon and all kinds of other additions. When I was originally doing research on kugels and their history, I was shocked to find that most recipes called for a cup or more sugar. That much sugar would send me into outer-space, so I can only imagine what it would do to our kids. My version is a much healthier toddler-and-family-friendly recipe that you could eat as a side dish or even for dessert! After it comes out of the oven, cut it into squares and take a bite of the soft, tender, creamy noodles perfumed with cinnamon -- you're in heaven. Of course Kenya tried to shove the entire square I gave him into his little mouth in one bite which he quickly figured out wasn't such a good idea! As for my friends with very strong opinions on what is and isn't kugel, most of them gave this their stamp of approval. 1. Bring a large pot of water to a boil. Add the noodles and cook for 5-7 minutes. You want them to be tender, but firm. 2. Strain the water off the noodles and place them in a large bowl. 3. Add the butter and toss the noodles so they’re evenly coated. 5. Place the eggs, cottage cheese, sour cream, agave and cinnamon in a food processor or blender and pulse to combine throughly. 6. Pour the liquid mixture over the noodles, add the raisins, and stir to coat. 7. Pour the noodle mixture into a 9 x 9 greased baking dish. 9. Cool and cut into square pieces. Yes :) it would be great! Could I substitute honey for the agave nectar? Thanks! When do you add the raisins? Just to keep the proportions right, what kind of egg noodles is it better to use: wide, medium, fine (these are the ones available at my store)? It probably does not make much difference for the taste but it seems that when you use cups to measure, for example, wide and fine noodles, the amount in one cup (in terms of weight) is not the same. Thank you in advance!